None who have known about the trials and tribulations of Israel can deny the fact that they are a special race of chosen people which cannot be extinguished by any hand without the will of God. Not to sound overzealous and sentimental. History has proven an accurate record of mass genocidal plans against the jewish peoples. Radicallly hunted, envied and exterminated by other nations and races of the world. The Jewish have been almost single handedly reduced to an extinct and even a few countable individuals who manage to spring back as the centre of dominance in the world. "If that is not divine then I don't know what else is"
One must give enough credit to this powerful nation on earth. As a country surrounded by vast Mediterranean, European, Asian and even North African enemies seeking to destroy it while yet thriving in their midst with its deeply rooted establishment as a force to be reckoned with cannot be over-emphasized. 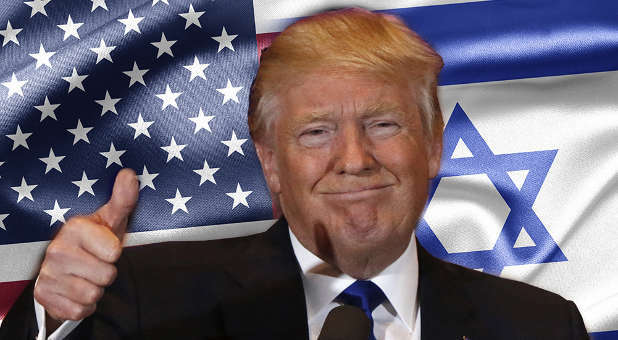 Recently, there has been word of Donald Trump fanning the embers of chaos by requesting for the new HQ of the United States Government to be moved to Jerusalem, the Sacred Capital City of the Jews. More intriguing is the fact that he is considering the recognition of Jerusalem as once more the capital city of the Israeli peoples. Though Trump has been challenged by those in his own governement and the citizens of the United States, they fail to see the importance of his actions in the long run. The Islamic Ideology according to history has proven that terrorism is a major tenet of Islam and there's no such thing as "radical islam" or "Islamic Fundamentalist" which is a favourite quote of Obama by the way. Islamic religion and teachings is a danger to society, most of their Koranic scriptures and passages emphasize on the violence and cold blooded murder of innocents, christians, jews or anyone who refuses to join the muslim teachings of Mohammed. For this single act alone, one can decipher that the religion is not a one of peace, stability and harmony as their imams and high imams claim it to be. The statement gives credence to the fact that arming Israel, returning the prime estate of it's former territories and assisting them financially in security efforts will put a firm and stable hold on this conglomeration of violent Kingdoms across the Mediterranean from spreading through-out the entire continent of the world with self-destructive philosophies. The historic and recent demonstration of Palestine, Israel's vassal neighbours within the same state being assisted by Muslim nations in terrorist activities of suicide bombings, mass shootings and missile attacks should be an example of how a world backed by muslim governments would be in the future if care was not taken to address them immediately. Some may say Palestinians have the right to stay on the same soil too but really ask yourself, "would you stay with a person whose every suspicious activity is to side with your enemies and destroy you so that he might inherit your apartment? If no, then the Palestinian question has been answered. The government and peoples of the United States and all other sensible countries of the world should see Donald Trump's approach as not one geared to aggrieve a Palestine nation as the Arabs pose in pretense but one made to ensure the stability of the world and its generations to come. One must visualize the dangers of a United Islamic Empire with unfettered access to launch codes of prime nuclear weapons before truly appreciating the presence of an Israel whose sole aim is in checkmating this mad desire for self destruction by the Islamist. Truly the first step would be to ensure the establishment of the state capital Jerusalem considered holy and sacred by the Israelis who would stop at nothing to defend her holy ground thereby saving the rest of the world. What Donald Trump does is not for the good of himself but for the good of mankind.